It was revealed last week that Warner Bros. and Legendary were teaming up to bring the titanic match up between two icons, with 2017’s King Kong reboot and 2018’s Godzilla 2 setting the stage for Kong vs. Godzilla in 2020. 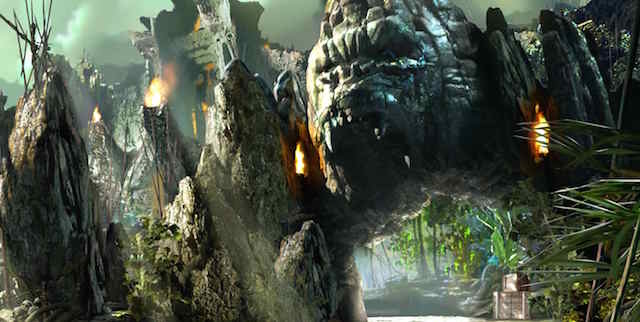 Cameras have just started rolling on director Jordan Vogt-Roberts’ Skull Island, and our first look at the set certainly sees it living up to the movie’s title. We also get our first look at cast member Samuel L. Jackson and the helicopter he has to learn to fly for his role. There’s certainly a 70’s feel to the movie, which has been the rumoured setting for a while now. With Monarch, the group that uncovered Godzilla and the Muto’s in 2014’s reboot of Toho’s giant lizard, said to play an important part in all three upcoming movies, it’s likely we’ll get to see their origins as well. Also starring Tom Hiddleston, John Goodman, Brie Larson, and Toby Kebbel, Kong: Skull island is set for release March 10th 2017.